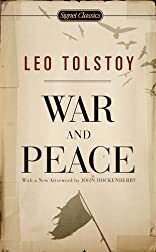 Set in the years leading up to and culminating in Napoleon's disastrous Russian invasion, this novel focuses upon an entire society torn by conflict and change. Here is humanity in all its innocence and corruption, its wisdom and folly. About Pat Conroy (Introduction) : Pat Conroy is a published author of young adult books. Some of the published credits of Pat Conroy include My Losing Season, My Losing Season, My Losing Season. About Ann Dunnigan (Translator) : Ann Dunnigan is a published translator of young adult books. Published credits of Ann Dunnigan include War and Peace (Signet Classics), Chekhov: The Major Plays. 5/25/2010 Marsha Macalush said: So it was always a goal of mine to say I read "War and Peace" and I finally did it about 5 years ago. Since then, I have reread it once. One of the greatest books of all time, a must read.